I actually think latkes are a GREAT holiday food. Potatoes, onion, egg, and flour - there isn't anything but yumminess in the basic recipe. And, latkes ARE nutritious when compared to Egg Nog, Christmas cookies, and candy canes. One latke has 24% of your daily value of Vitamin C - take that chocolate Santa! Even though I have attended ONE Hanukkah celebration in my entire life, I decided to take on the lighter latke because a reader asked me to give it a shot. First, I used my grater on my food processor. There was NO WAY I was going to grate 3 potatoes and an onion without one. This made making the latkes really fast and easy. I squeezed out the liquid from the potato and the onion, added egg and flour, and then attempted to fry them with less oil than 3 cups. I used a cast iron pan and managed to use one tablespoon of oil for every four latkes that I cooked. They were seriously tasty and left the plate as soon as I placed them there. If you are trying to serve people that can WAIT, put them in the oven at 200F to keep them crispy. Other lighter latke recipes used zucchini, cauliflower, and sweet potatoes to lighten the recipe. These make a great, fast, easy and comforting last minute dinner. We served them with some chicken apple sausages. YUM! 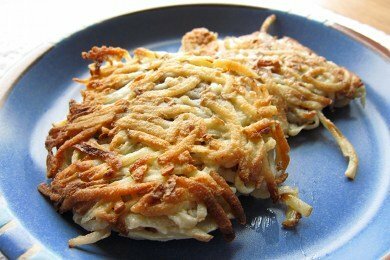 Do you have a tip for a lighter latke? Please share. Grate potatoes and onion in food processor with a coarse grater. Transfer to colander and squeeze out potato liquid. Mix eggs and flour into the potato-onion mixture. Heat a cast iron or non-stick skillet with one tablespoon oil until the oil starts to smoke. Fill your palm with the potato mixture and pat into a 2 inch diameter circle. Put four pancakes into pan and cook until brown on both sides (about 6 minutes). After you remove the first batch, add one tablespoon oil to cook the next batch. Repeat with all of the batter. Keep hot in a 200 F oven and serve! These taste great cold and room temperature as well (but they will lose their crispness). At what temp do you heat the oil? @Gloria - the oil starts to smoke in the pan - I don't know what temperature that is - I used olive oil and when the latke hit the pan - I got a nice sizzle. Sorry I can't be more exact. @Gloria - No, it is me that is clueless - because most recipes would say - turn the stove to HI and then heat the oil until smoking. I left that out! (novice recipe writer here). I've been to a few Hanukkah parties and we make them regularly even though we aren't Jewish. I hadn't thought to measure the oil in the pan, I do just enough to cover the bottom and often substitute onion powder for the onion. I used to grate them by hand after destroying the shredding blade on my inexpensive food processor. I ended up getting the shredder attachment for my Kitchen Aid mixer and that does the trick. My kids love them dipped in sour cream or applesauce. I can eat them plain out of the pan. Thanks for the recipe, it made a delicious addition to dinner. Lucky for me I work for a giant in the supermarket business, who shall not be named, and we sell among other things potato, garden vegetable and sweet potato latkes.